In an intimate portrait of migrant life along the U.S.-Mexican border, Hannah Weyer’s new film LA BODA delves into the challenges faced by a community striving to maintain their roots in Mexico, while pursuing the “American Dream” across the border. Weyer’s camera follows Elizabeth Luis during the weeks before her marriage to Artemio Guerrero, interweaving the anticipation of the upcoming wedding with candid stories that explore the architecture of the Luis family. For 22-year-old Elizabeth, migrant life has meant shouldering responsibilities beyond those of an average young adult. Along with her seven siblings, she has contributed to the family income throughout her adolescence and young adulthood, often forced to sacrifice school for fieldwork and social life for travel as she and her family move between Texas, California and Mexico. LA BODA tells the timeless story of a young woman’s coming of age, while also confronting negative stereotypes of the migrant community with the real life biography of a Mexican-American family bridging the gap between countries and culture. "In' La Boda', promising filmmaker Hannah Weyer creates an audio-visual portrait that belongs in the extended American family album, with the story of a wedding in one migrant's family. The family's open generosity to Weyer is as remarkable as her skill at sketching their characters. Along with sibling affection and mother-daughter tiffs, the film takes us across borders we rarely even see: borders of class and nation, and the many borders crossed every season by the people who harvest the nation's food. 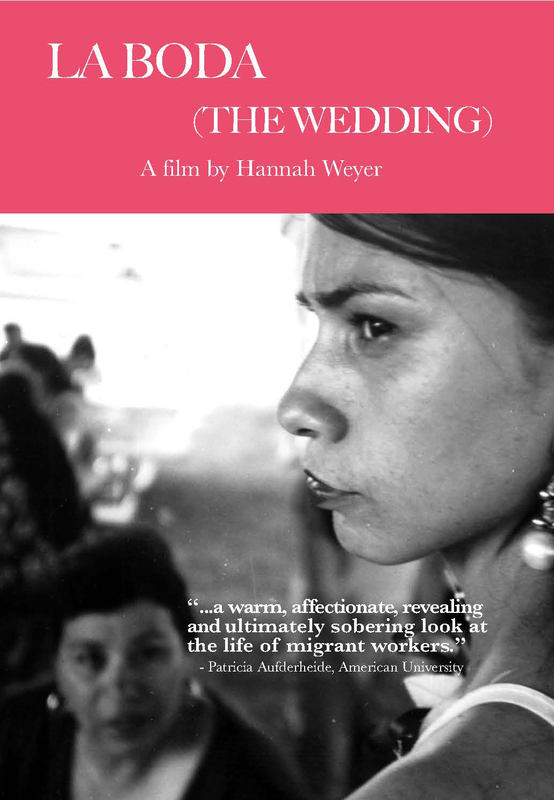 La Boda is a warm, affectionate, revealing and ultimately sobering look at the life of migrant workers, as it follows the daughter of the family through her wedding. It illuminates discussions of immigration, class, gender, culture and the economics of agriculture under globalization. It will be equally useful in American studies, sociology, and women's studies." "Thoroughly charming and touching...one can't help but feel bouyed by Elizebeth's girlish dreams and the unwavering strength of the community's family traditions." Hannah Weyer is an American filmmaker living in New York who has written, directed and produced narrative and documentary films. Her films have screened at the Human Rights Watch, Sundance and the New York Film Festivals and have won recognitions, including awards from LoCarno, Sundance, Doubletake Documentary and South by Southwest Film Festivals. Her documentaries aired on PBS as part of the POV-American Documentary series and screenwriting credits include work that has premiered on HBO, including Life Support (2007), directed by Nelson George, and which earned a Golden Globe award for its lead actress, Queen Latifah. Most recently, she completed a novel set in Far Rockaway, Queens entitled "On the Come Up” which will be published by Nan Talese/Knoff in July, 2013. Weyer received her Master’s degree in Film from New York University in 1994. Her short film, The Salesman and Other Adventures won awards at the Sundance, Locarno, Melbourne, and Claremont-Ferrand Film Festivals. It was broadcast on Canal+ France, Canal+ Spain, Italy's EDB, Channel 4 in England, and here in the US on PBS. In 2000, Weyer produced and directed La Boda, an hour long documentary which screened at the Human Rights Watch Film Festival and the New York and Los Angeles Latino Film Festivals. La Boda first aired nationally as part of the PBS program, POV-American Documentary, and then again as an "encore performance" during the series’ 2001 line-up. Weyer then went on to complete, La Escuela which premiered on POV-American Documentary during its 2002 season. La Escuela received Special Jury Prizes from the San Antonio Film Festival and the South by Southwest Film Festival and was awarded the MTV News/Doc Award at the Doubletake Documentary Film Festival. It was selected by the Young Adult Library Services Association (YALSA) as one of 2003’s top 10 Documentaries for Young Adults. Weyer frequently collaborates with writer/director Jim Mckay (Girls Town, Our Song, Everyday People). Along with Mckay she co-wrote the film, Angel Rodriguez (2005) which premiered on HBO. She also co-wrote the HBO film, Life Support (2007), directed by Nelson George. LA Weekly's Review of "La Boda"
Unlike any other, the annual debutante ball in Laredo, Texas is part of a lucrative month-long festival honoring George Washington’s birthday. LAS MARTHAS follows two young women as they prepare for this elaborate rite of passage: Laurita, a 13th-generation debutante descended from Laredo’s original Spanish land grantees who questions debutante society’s class system geared toward girls like herself; and Rosario, a high-achieving, Mexican-raised and U.S.-schooled outsider struggling to understand the elite society’s unspoken rules. Tracing the event’s origins back to 1898, the film works to unravel why a town like Laredo – with a population that is 98% Mexican – feels such affinity for America’s Founding Father. Despite history and all odds, the celebration perseveres and flourishes thanks to the Mexican American girls who wear this gilded tradition in the form of elaborate colonial gowns. LAS MARTHAS is a beautifully drawn and sometimes humorous, coming of age portrait of these two young women as they navigate this complex tradition in a time of economic uncertainty and political tension over immigration and border relations between the US and Mexico. NI AQUI, NI ALLA illuminates the challenges facing an undocumented college student and her family. Blanca, a second-year student at the University of California, Berkeley, crossed the border from Mexico into the United States with her parents when she was a child. As a student under the California DREAM Act who possess DACA (Deferred Action for Childhood Arrivals), Blanca qualifies for financial aid and has temporary protection from deportation, though her undocumented parents, who live and work in California's agricultural Central Valley, do not. NI AQUI, NI ALLA paints an intimate portrait of an undocumented family as they support each other during a turning point in their lives and stay together through the distance. At a time in this country’s history where the debate around immigration is highly contested and demands to close the border are in the daily news, NEITHER HERE, NOR THERE paints a very human face on an issue that many use simply as partisan, political fodder. Essential viewing for Anthropology, Sociology and Multicultural and Immigration Studies.